Spotify has two tiers of Spotify listening, Free (with Ads) and Premium (without Ads). No matter you are free user or Premium user of Spotify, you can access a catalog of about 40 million songs. 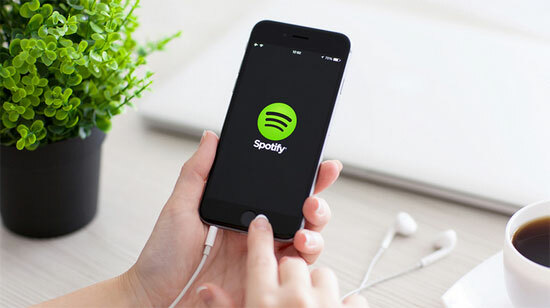 However, as Spotify is a streaming service that adds a DRM layer to its streaming music collection, so we are often restricted to play Spotify music as we wanted. In this article, we will teach you the best 3 ways to enjoy Spotify music without worry about wasting cell phone traffic. Method 1: Enjoy Spotify Music on the WiFi Environment. The best way to listen to Spotify music or other similar music streaming services, is to play songs from your phone or tablet over WiFi. With WiFi, you don’t have to worry about losing your audio signal as long as you have a WiFi signal. So, if your WiFi is set up to cover your whole house, you can keep your phone in your pocket and never have to worry about loosing signal. Disadvantages: WiFi is still expensive. Although Prices have come down a lot, but it still costs a lot. Besides, if your network is unstable enough, it's hard to stream lossless audio from Spotify. The second method is to download Spotify music for offline listening. After Upgrading to a paid premium plan, you can use the Listen Offline function to download & store Spotify music on your phone for offline playback. In this way, you can listen to Spotify music without an internet connection and save lots of your mobile data. Disadvantages: Spotify Premium users can only download 3,333 songs per device, on a maximum of 3 different devices. Besides, since the offline playback function is only privilege for premium users. So if you cancel your Spotify premium subscription, all your tracks that you downloaded for offline listening will be unavailable. The above two methods can't help us to download and keep Spotify songs forever due to all of Spotify music are protected by DRM. So the third method is to download Spotify Music to plain MP3, AAC, FLAC or WAV for storing on our local computer with third-party software called Sidify Music Converter for Spotify. In the following, we just take Windows version of Sidify Music Converter as an example to show you how to remove DRM from Spotify and download Spotify songs or playlist to plain formats. Step 1: Download and Install Sidify Music Converter for Spotify on PC. Download and install Spotify Music Converter on PC, then launch it and Spotify App will be loaded automatically. Step 2: Add Music or Playlists to Sidify Music Converter for Spotify. Search for the music you want to download on Spotify and copy the music URLs, then click or "Click Here to Add Audio" to add Spotify music or playlists. Or you can Drag & drop a song or a Playlist from Spotify. After finishing adding tracks or playlists from Spotify, click to choose output format like MP3, AAC, WAV or FLAC. And here you also can set the output quality and conversion mode. Once all the settings finished, click "Convert" button to start converting Spotify music to the format you choose. Just click to find the music you downloaded from Spotify. Now, all the Spotify Music are converted to DRM-Free format, so you can sync them to your Android/ iOS phones, tablet or other MP3 player for enjoying as you want even when you don’t have a cellular or WiFi connection. Note: The trial version of Sidify music converter for Spotify enables us to convert 3-minute for each audio file, you can unlock the time limitation by purchasing the full version. How to Sync Spotify Music to iPod Shuffle?